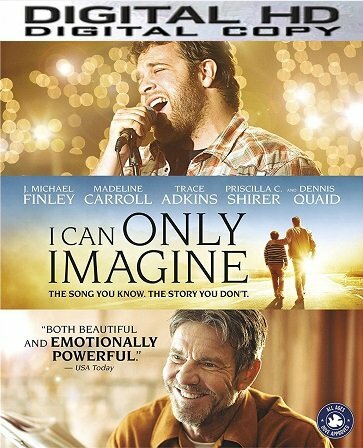 Digital UltraViolet and Digital Copy will makes it possible for you to stream the movie I Can Only Imagine HD UV Ultraviolet Code instantly to your computer and compatible Smartphones, Andriod, iphone, iPod Touch, iPad and tablets devices anytime, anywhere. You can also download a Digital UltraViolet Copy or a Digital Copy of the movie I Can Only Imagine HD UV Ultraviolet Code to your computer and compatible devices. FORGIVENESS SETS US FREE TO BECOME THE BEST VERSION OF OURSELVES. This movie reminded me of some of my own hurts I'm still working through. It was inspiring and moving without milking the tearjerking opportunities. It was very well done with good acting and a natural storyline that held together. Forgiving those who hurt us, receiving gracious forgiveness from God, and last but not least, forgiving ourselves this movie does a beautiful job illustrating these 3 pillars of emotional and spiritual wellbeing. Authenticity is the key message of this movie. It shows that we cannot run from our past, but dealing with it allows us to break free and soar to our fullest potential. A powerful message and great for the family.